Please refer to our stock # 11540 when inquiring. 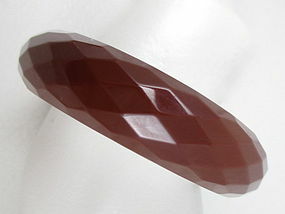 This great vintage bracelet is 3/4" wide with a 2 1/2" diameter opening and is handcrafted from chocolate brown bakelite. It has 3/8" thick walls and an elaborate multifaceted design. It has been tested for bakelite, and it is in excellent condition.